These Homemade Almond Clusters are one of my all time favorites. The inspiration for this recipe came from Giada De Laurentis on the Food Network. 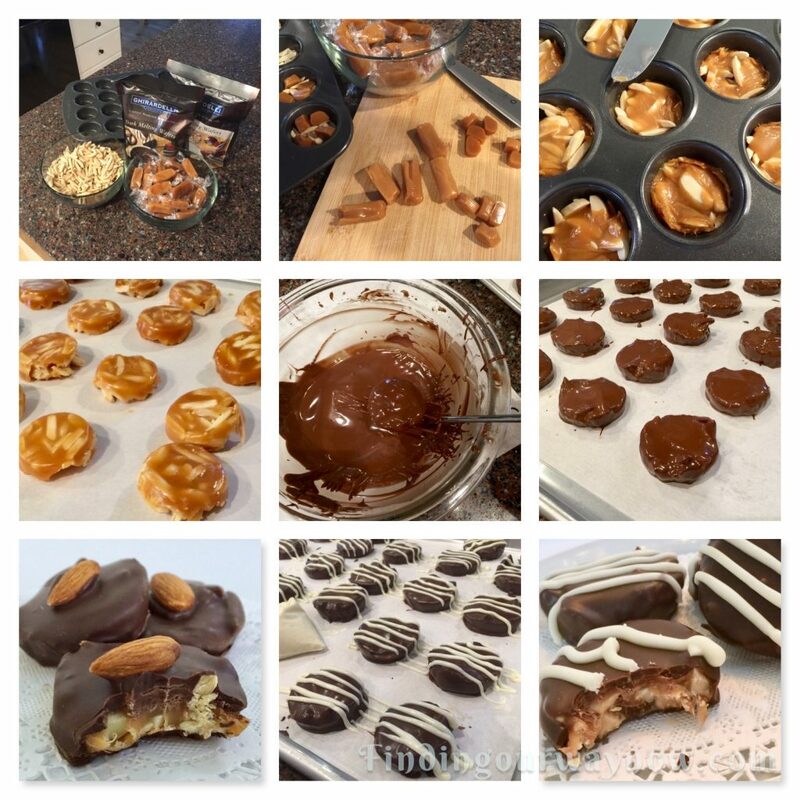 These almond clusters never fail to surprise me with how easy they are to make. The fact that they’re totally yummy is a good thing too. 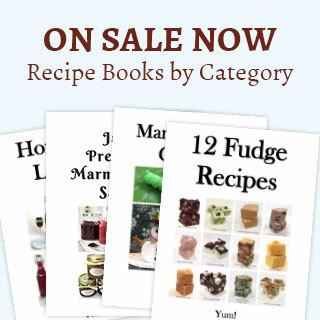 It’s one of the many recipes we make as a gift around the holidays or any special occasion. When we add some other homemade chocolates to the mix, it’s a winner all the way around. Ingredients: Makes 24 Almond Clusters. Preheat the oven to 350° F. Lightly grease a mini-muffin tin with butter. Place 1 heaping teaspoon of slivered almonds in each of the muffin cups. Unwrap the caramel candies, cut each caramel into quarters and place four pieces in each muffin cup on top of the nuts. Bake in the oven for about 5 to 7 minutes until the caramel is melted, bubbly, and begins to spread. Remove from the oven. Using a small knife, gently go around the outside edges of each cluster and fold the caramel that’s on the side on top of each cluster. Allow the clusters to cool in the mini muffin tin for about 5 to 10 minutes. Using the same small knife, carefully remove the nut clusters from each cup and place upside down on a parchment-lined baking sheet. Using two double boilers, carefully melt the dark chocolates over very low heat. Carefully dip each cluster in the melted chocolate coating it completely. A candy-lifting fork is helpful with this step. Tap the fork a bit on the side of the pan to shaking off any excess chocolate. Transfer the coated clusters to a parchment lined baking sheet allowing them to set. Garnish the tops of each cluster with a drizzle of white or milk chocolate. 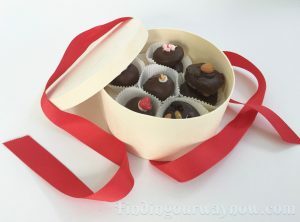 Place the homemade almond clusters in the refrigerator for about 20 to 30 minutes or until the chocolate is set. Notes: Be careful not to over cook the caramel, or it will it be difficult to remove the clusters from the muffin tin. In any case, at times a little gentle prying may be necessary to remove the clusters. Always use butter to grease the muffin tin; any other type of oil doesn’t allow the nut clusters release form the muffin tin as easily. The variety of caramel will make a difference. The softer the caramel, the faster it melts and the more it will ooze around the nuts. I often use a piping bag to garnish/decorate the clusters, making it simpler to do the job. If desired, you can vary the recipe by using a different type of nuts in place of the almonds such as pecans, walnuts, peanuts or hazels nuts. 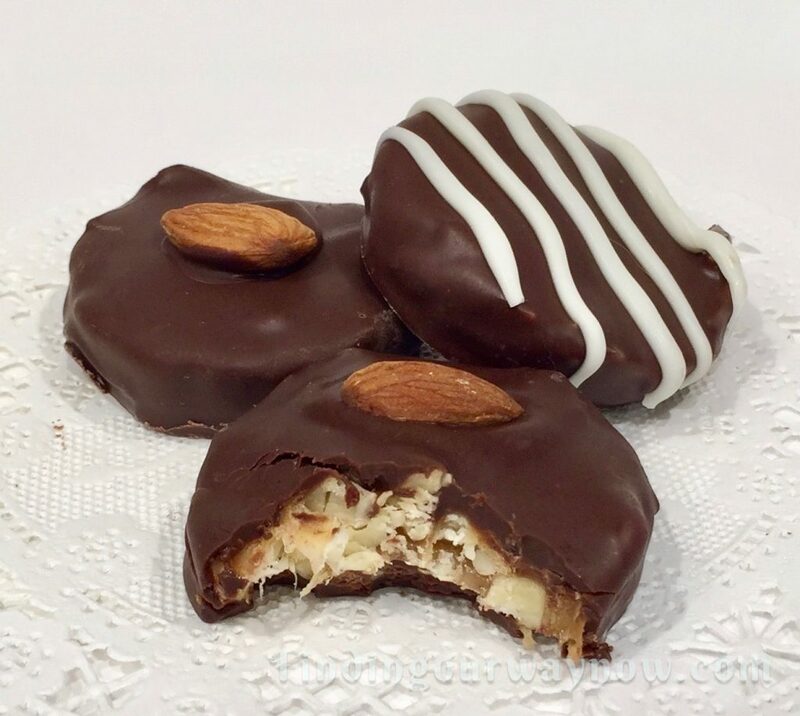 When we make these Homemade Almond Clusters as a gift, we’ll package them, along with some of my other homemade chocolates, in a pretty box or tin with an appropriate ribbon color. They’re always a welcome and appreciated gift when we share them away for any reason or occasion.